When choosing a prenatal supplement, look for one with Omega-3 fatty acids. Pregnant women can lose up to 50% of Omega-3 fatty acid stores, so it is important to replenish what is lost. Taking PrimaCare™ with 470 mg Omega-3s is a beneficial way to improve stores before and after pregnancy. PrimaCare™ delivers three forms of Omega-3 fatty acids: DHA (300mg), EPA (120mg), and ALA (50 mg). DHA and EPA are Omega-3 unsaturated fatty acids derived from ALA. They must be acquired through diet, as we cannot make our own Omega-3s naturally. References: 1. Data on File. Avion Pharmaceuticals LLC, Alpharetta, GA. 2. Schmidt RJ, Tancredi DJ, Ozonoff S, et al. Maternal periconceptional folic acid intake and risk of autism spectrum disorders and developmental delay in the CHARGE (Childhood Autism Risks from Genetics and Environment) case-control study. Am J Clin Nutr. 2012; 96:80–89 3. McGregor JA, French JI. Optimizing perinatal and maternal nutrition: omega-3 fatty acids and folic acid. Female Patient. 2008; (suppl):19-23. 4. Greenberg JA, Bell SJ, Van Ausdal W. Omega-3 fatty acid supplementation during pregnancy. Rev Obstet Gynecol. 2008; 1(4) (suppl):162-169 and future directions. Am J Clin Nutr. 2006;83(Suppl):1536S– 1538S. 5. Helland IB, Smith L, Saarem K, Saugstad OD, Drevon CA. Maternal supplementation with very-long-chain n-3 fatty acids during pregnancy and lactation augments children’s IQ at 4 years of age. Pediatrics. 2003; 111(1):e39-e44. 6. Carlson S. Docosahexaenoic acid supplementation in pregnancy and lactation. Am J Clin Nutr. 2009; 89(Suppl):678–684. 7. Jones ML, Mark PJ, Waddell BJ. Maternal dietary omega-3 fatty acids and placental function. Reproduction. 2014; 147:R143–R152. 8. Storck S. Fetal Development. NIH MedlinePlus Website. http://www.mayoclinic.org/healthyliving/pregnancy-week-by-week/in-depth/prenatal-care/art-20045302?p=1. Updated September 30, 2013. Accessed December 29, 2014 9. Carlson SE, Colombo J, Gajewski BJ, et al. 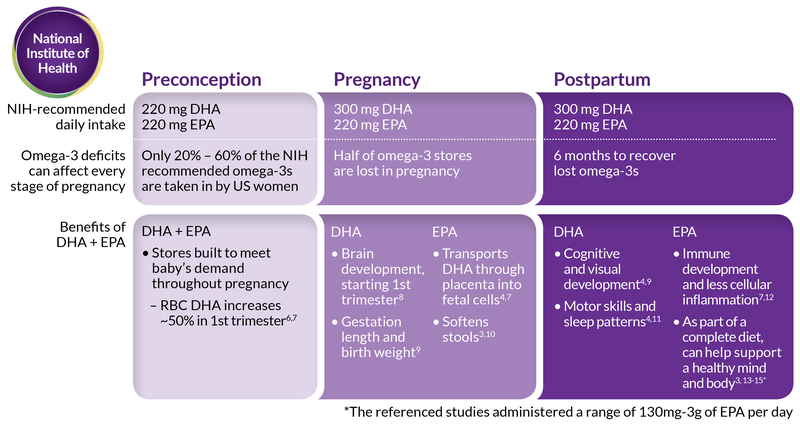 DHA supplementation and pregnancy outcomes. Am J Clin Nutr. 2013; 97:808–15 10. Thompson L, Spiller RC. Impact of polyunsaturated fatty acids on human colonic bacterial metabolism: An in vitro and in vivo study. Br J Nutr. 1995; 74:733-741. 11. Cheruku SR, Montgomery-Downs HE, Farkas SL, Thoman EB, Lammi-Keefe CJ. Higher maternal plasma docosahexaenoic acid during pregnancy is associated with more mature neonatal sleepstate patterning. Amer J Clin Nutr. 2002; 76:608-613. 12. Prescott SL, Wickens K, Westcott L, et al. Supplementation with Lactobacillus rhamnosus or Bifidobacterium lactic probiotics in pregnancy increases cord blood interferonc and breast milk transforming growth factor-b and immunoglobin A detection. Clin Exp Allergy. 2008; 38:1606–1614 13. Akabas SR, Deckelbaum RJ. Summary of a workshop on n_3 fatty acids: current status of recommendations 24(5): 680–686. 14. Wojcicki JM, Heyman MB. Maternal omega-3 fatty acid supplementation and risk for perinatal maternal depression. J Matern Fetal Neonatal Med. 2011; 15. Markhus MW, Skotheim S, Graff IE, et al. Low omega-3 index in pregnancy is a possible biological risk factor for postpartum depression. PLoS ONE. 2013; 8(7) e67617:1-12. doi:10.1371/journal.pone.0067617. 16. General Chaper <2232> Elemental Contamination in Dietary Supplemen: Second Supplement to USP 40-NF35, December 2017. 17. Data on file. Avion Pharmaceuticals, LLC, Alpharetta, GA.